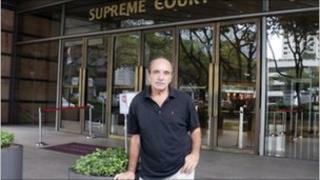 Singapore police have arrested the British author of a book about the city-state's use of the death penalty. Alan Shadrake, 75, is being detained on criminal defamation charges which carry a two-year prison sentence. However, the government says the book - which includes an interview with a former hangman - has not been banned. Mr Shadrake told reporters before his arrest that he was expecting trouble when he went to Singapore at the weekend to promote his book. "If they do anything, it'll just draw more attention to it all, and they have no defence," he told AFP news agency. Mr Shadrake, who divides his time between Britain and Malaysia, is an investigative journalist and author. He has written for many international newspapers and the first major book in his 50-year career was The Yellow Pimpernels, which detailed escape stories across the Berlin Wall. His latest book, Once a Jolly Hangman - Singapore Justice in the Dock, includes an interview with Darshan Singh, the former chief executioner at Singapore's Changi Prison, who has since retired. It also includes interviews with human rights activists, lawyers and former police officers. But the attorney general's office says the book casts doubt on the impartiality, integrity and independence of Singapore's judiciary. It wants to add contempt of court charges to the criminal defamation investigation that police say is already under way. The government told the BBC last week that the book had not been banned but that the government had the right to advise bookshops not to stock it. The death penalty is mandatory in Singapore for murder, treason, drug trafficking and other crimes. Officials say it has been a key factor in keeping the crime rate low. Human rights monitors have long criticised the government however for using defamation suits to stifle political opposition. Separately, Singapore has banned a movie made by a local film-maker about a human rights activist, saying the film was not in the public interest. Martyn See's film about former political detainee Lim Hock Siew features Mr Lim making a rare public speech about why he believes he was unfairly jailed. He was detained from 1963 for two decades as part of an operation that the government said was to end communist influence in Singapore.